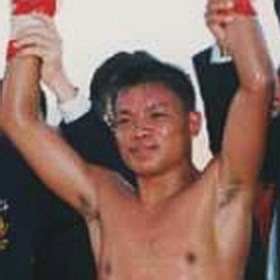 Samson Esarn from Isan, was a Lumpinee and Rajadamenrn stadium champion. Samson in his fight career fought under many names including Sanmuengnoi Lookchaopawmaheasak, Samson 3-K Battery or Samson Toyota-Thailand and Samson Elite Gym. Samson then switched sports to international boxing. Samson was champion of the World boxing federation (WBF), a minor league boxing sanction. Samson retired undefeated with a record of 43-0 in 2002. When he ended his career it was as Samson Dutch Boy gym. Much as he was in international boxing Samson was a south paw and did have significant knockout power. However he was a calculated pinpoint striker. Samson always seemed to strike only when the moment was right. Also much like his international boxing days Samson was known for ending fights by knocks in Muay Thai, evident in this classic match up of Samson versus Veraphol. ~ by fatsoking on October 31, 2012.
that Esarn name…any (gym) relation to Superlek Sorn-Esarn? Honest answer? I have not a clue.